206 pages | 29 B/W Illus. Museum curators enter the profession with a specialist subject qualification and yet at some point in their career, many curators find themselves in charge of a range of collections outside of their expert knowledge. Interpreting, curating and caring for mixed collections demands of curators a wide range of knowledge and understanding. The Curation and Care of Museum Collections is designed to give curators the fundamental information and confidence they need to manage and care for all of the collections within their responsibility, regardless of their previous training and experience. Comprising two sections – Museum Collections, and Collection Development and Care – the chapters cover archaeology, art, history, military and natural sciences collections, as well as heritage properties. Every chapter in the book is focused on one type of collection, but all chapters in the collection management section contain advice on topics such as organisational philosophy, documentation, legal issues and materials in order to provide a useful and comprehensive guide to managing collections. The collection care section is structured in the same way, considering the issues of storage; display; handling; moving; packing; housekeeping; health and safety; emergency preparedness; and pest, pollution, environmental, light and vibration management. The contributors to this book are experienced museum professionals, each with their own specialism and a deep understanding of what it means to work in the context of mixed collections. 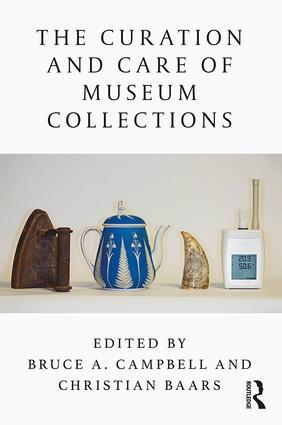 Providing a highly practical guide, The Curation and Care of Museum Collections is essential reading for curators working in all types of museums, galleries and heritage sites, and for students of museology courses around the world. Bruce A. Campbell is an Associate Tutor at the School of Museum Studies, University of Leicester. Christian Baars is Senior Preventive Conservator at Amgueddfa Cymru-National Museum Wales in the UK.